A new layer is added every time I start up the game and load the save. All doors are affected. inb4 "jvs is stuff use default"
JVS doesn't add duplicate events. Might be the support legacy, disable it. The cause, is that one of your add-ons is forcing the server to run fxDTSBrick::onPlant instead of fxDTSBrick::onLoadPlant while bricks are loading. 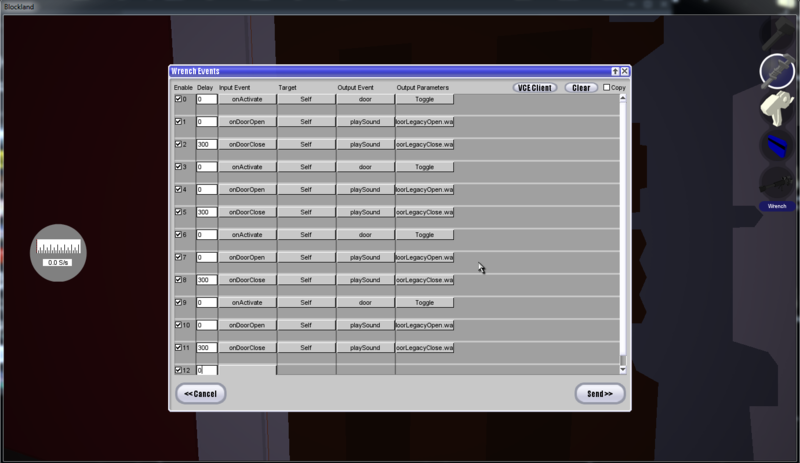 This means that Door bricks will perform their "first creation" actions, which include adding some default events. Disable Kalphiter's elevators if you have them. That's the most common culprit. If that doesn't work, post a list of your enabled add-ons. I think that can be found in config/server/ADDONLIST.cs or something like that. Does Support_Legacy still give some JVS door ghost bricks collision? I know I made a fix for that at some point.